The EVRI License_Server allows monitoring the number of users operating under a given Eigenvector Research, Inc. (EVRI) license. of PLS_Toolbox or Solo. When operating with this server, individual copies of PLS_Toolbox or Solo are required to contact a network-mounted server in order to operate. The license system consists of two parts: a server which must reside on a network-accessible computer and a client that runs on the end-user’s computer. All communication between client and server is done over standard TCP/IP sockets. When an individual starts up Solo or PLS_Toolbox, the client application (Solo or MATLAB) contacts the server to request a license. The server, upon receiving this request, first verifies an Access Code to confirm the validity of the request. Once confirmed, the server identifies the number of allowed licenses and the number of currently issued licenses. If any licenses are available, the server issues a license to the user with a fixed timeout period (this defaults to 20 minutes in the current license server, but can be configured). This license is keyed to the individual’s computer and the IP address of that user. Once a valid license is issued, the client will operate independently of the server until the reissue time passes (set at 10 minutes before the end of the license period). After that time period has passed, the client requests re-issuance of the license. The server will automatically reissue the license to the original client. If for some reason the license server is not reachable (e.g. network outage), the client will warn the user but continue to operate until the full license timeout period has passed (20 minutes). The client will repeat the request for a license periodically over that time. After the license has expired, the client will stop PLS_Toolbox or Solo from operating. If a given user does not request re-issuance of their license before the license expires (e.g. the user has finished working with the product), the server considers the license use complete and makes it available for another user. Thus, a given license is considered “checked out” for 20 minutes from the last contact with a user. Users can check a license back in manually by either closing Solo, or issuing a special Matlab command (for PLS_Toolbox). Eigenvector Research, Inc. (EVRI) will provide to you a copy of the EVRI License_Server (requires the Java Runtime Engine version 1.5 or later) and a license file (evriserverlicense.xml). Most operating systems already contain the necessary files to execute the server application. The server can be run either as a background service with no interface, or as a desktop application with a status window. Follow the directions below as appropriate for your operating system and preferred interface. Also, this computer must have Java (version 1.6 or later) installed since the license server is a Java program. Confirm java 1.6 or newer is installed. Copy the application files onto the computer that will operate as the server (which must be a network accessible computer). Copy the evriserverlicense.xml file into the same folder as the EVRILicenseServer.jar file. On this computer, either double-click the EVRILicenseServer.jar file, or add it to your system startup folder (operating system dependent location - whatever is appropriate for the OS) to automatically start the server on startup. Once started, the server can only be stopped by using the Task Manager processes tab (in Windows) or other standard task kill operation (MAC OS X or Linux). EVRI has pre-configured the server so there is no additional configuration necessary. copy the application files onto the server computer. copy the evriserverlicense.xml file into the "service" sub-folder (for 32-bit computers) or "service64" sub-folder (for 64-bit computers). 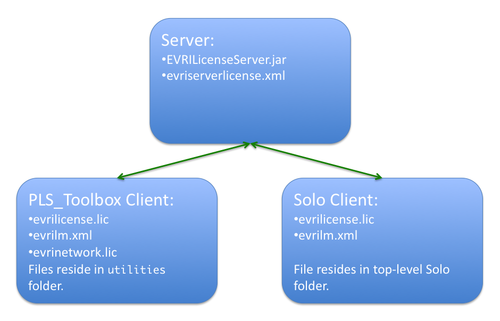 When running as a windows service, the evriserverlicense.xml file must be in this sub-folder, not the top-level application folder. run the Install_Service.bat file in the service (or service64) folder to install the service (this batch file must be run by a user with administrative privileges). To uninstall the service, run the Uninstall_Service.bat file. Copy the evriserverlicense.xml file into the daemon_linux sub-folder (for 32-bit computers) or daemon_linux64 sub-folder (for 64-bit computers) of the server application (same folder as the Install_Daemon file). When running as a daemon, the evriserverlicense.xml file must be in the appropriate daemon_linux folder, not the top-level application folder. and continue. You may also need to precede the sed command with "sudo". The value 2212 can be replaced with any valid port number. Note, however, that the server must be shut down and restarted to register the changes to this file. This new tag should appear above the ending </license> tag. The value specified as time_in_minutes must be greater than 10 and will define how long the server will reserve a license for a user without hearing back from that user. NOTE: Changing of license expiration time is only compatible with PLS_Toolbox and Solo versions 5.0 or later. Contact EVRI for a patch to use this feature with earlier versions (<=4.2). The license server can also be configured to create a separate pool of licenses which can be checked out for extended periods (or, in general, a period of time different from the standard timeout period described above). Users access these licenses by supplying a separate access code different from the standard access code used to access the standard licenses. Note that these additional tags are enclosed by the <extended></extended> tag pair indicating that these settings are for the special extended licenses only and that the <extended> tags are inside the <license> tags. The <accesscode> tag is required to be a non-empty string which the users will use in place of the standard access code (see Client Configuration below) to access this separate extended license pool. The standard access code will still be used to access the standard license pool. The <allowedseats> tag specifies how many of the total allowed license seats (specified by EVRI) can be checked out as extended licenses. This number cannot be greater than the number specified earlier in the file in the main <allowedseats> tag. The <timeout> tag specifies the amount of time (in minutes) an extended license is valid for. The <reservedseats> tag is optional and, if specified, defines the number of license seats that can only be checked out as extended licenses. The default value is zero, meaning that all license seats are available as standard licenses. Note that four of the licenses can only be checked out as standard licenses. The other four licenses can be either standard or extended licenses. If <allowedseats> in the extended tag segment of the file had been set to “8”, all eight licenses could be checked out as either standard or extended licenses. NOTE: The total number of allowed seats (set in the main license tag segment of the file) and the main access code cannot be modified by the user. This value is fixed and is specific to the license issued by Eigenvector Research. To change the total number of license seats, contact Eigenvector Research. In general, the server will handle inappropriate settings by defaulting to the un-modified behavior, but if the settings you have chosen are invalid or the file is not valid XML format, the server will return an error on startup. It is recommended that you make a copy of the original license file supplied by Eigenvector Research in order to recover from such mistakes. Under no circumstances should the user modify the top-level values for <accesscode> <configid> or <allowedseats> (the tags at the top level of the <licenses> tag, not those in the user-modifiable <extended> tag). Changing these values will cause the server to fail. Download the ZIP version of PLS_Toolbox, available from your account on Eigenvector.com. Unzip the file onto either a network-accessible drive or a local drive on a given client’s computer. If provided, these files should be copied into the PLS_Toolbox/utilities folder (see notes below regarding evrilm.xml file). NOTE: If you are using a demo version of PLS_Toolbox, you will require an additional updated file (evriio.p). Start MATLAB and change the working directory to the installation folder. If prompted, enter a license code provided by EVRI. If prompted, enter the IP address (or other DNS-accessible computer name), the port number (2212, unless otherwise specified by EVRI), and Access Code (supplied by EVRI). This information can also be included in a file named “evrilm.xml” and placed in the PLS_Toolbox/utilities folder. The format for this file is discussed below. This should return your serial number and today’s date. Where ip_address is replaced with the IP address or DNS-resolvable computer name, 2212 is the port address, and serial_number is the supplied Access Code (usually your site license serial number). If an evrinetowrk.lic file has been stored in the utilities folder and PLS_Toolbox and all sub-folders have been added to the Matlab pathdef.m file stored on a server-mounted copy of Matlab, then the above steps will not be necessary. In this case, Matlab will already have PLS_Toolbox on its path when started by any user and users will not have to run any install procedure. To add PLS_Toolbox to the default path, simply start Matlab as an administrator with write privileges for the folder containing pathdef.m. Where aaa.bbb.ccc.ddd is the new IP address. Note that this must be done immediately after starting up Matlab and before any PLS_Toolbox commands are used. If no evrilm.xml file was used, this command will re-prompt you for a new license code and server information. where 'zzz' is the access code for extended-period licenses specified by the administrator, as described above. Once connection to the server is made and the license is verified, Solo will operate as expected. If Solo sits unused for a period of time, you may lose your license on the server and may have to wait for a new license to become available. Leaving Solo open during this time will allow you to pick up your work where you left off. If an evrilm.xml file was used to originally configure Solo to locate the server, modify the file to contain the new IP address and restart Solo. If no evrilm.xml file was used, restart Solo and you will be re-prompted for a new license code and server information. a) use the Workspace Browser menu: "Help > Reset License" then enter new access code specified by the administrator, as described above.